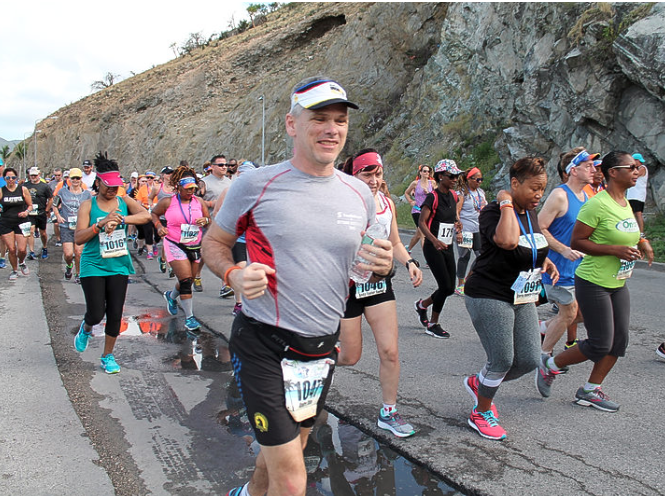 PHILIPSBURG–Some 252 runners and walkers from the cruise ship Adventure of the Seas took part in a 5K charity run on Sunday, organized by Tri Sport to support the K1 Britannia Foundation. 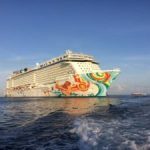 The group from “Run for Fun Cruise Tours” take part in five or 10K runs around the world on different ships and makes donations at each destination. Tri Sport had suggested the runners bring useful items based on a list provided by K1 Britannia. 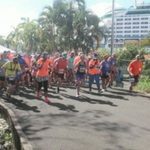 The runners duly disembarked from the cruise ship carrying shopping bags of supplies that were handed over to KI Britannia representatives before the run. Due to Heineken Regatta preparations K1 Britannia representatives had not had time to sort through all the donations, but noted there were a lot of various hygiene products. Following a briefing by Tri Sport’s Juan Pablo Piscione, the large group comprising young and old assembled for the start outside the Dr. A.C. Wathey Cruise Ship Pier entrance where they met some 20 local runners. The runners first entered Pointe Blanche for a loop and then headed down to Bobby’s Marina and onto the Boardwalk. They ran the entire length of the Boardwalk before returning to finish at the Passangrahan Hotel. The first male and female runners to finish the timed run from the cruise ship group were Michael Horlick and Meredith Aziz, respectively. Omarco Robinson was the first male runner to finish from the local group (17:04) and Cecilia Mobuchon the first female (19:28). From the local group Eriel and Eriak Bendahan, ages eight and 11 respectively were two of the youngest runners. Run for Fun support staff provided the timers (Don and Rebecca Gallagher), videographer Trent and photographer Gary Cooke. The cruise ship group had signed up for two catamaran sail excursions in the afternoon, a market visit and relaxing on the beach. Winners were announced but a prize giving was due to be held on the ship.